Students of Plainfield High School were greeted by a black dummy hanging by its neck when they arrived at Arthur L. Johnson High School for a basketball game Saturday. 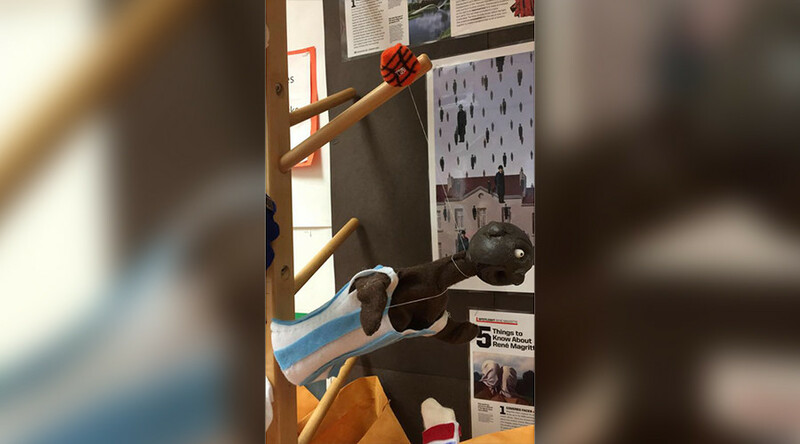 The Plainfield team was sent to change in an empty classroom where they found the offending black dummy hanging from a string, eyes bulging, complete with a basketball. Arthur L. Johnson High School’s student population is 0.8 percent black, while Plainfield students are 50 percent black, according to a 2010 state census, My Central Jersey reported. An image of the dummy was shared on Facebook. A number of commenters said Clark, New Jersey, had a reputation for being a racist town. According to the 2010 census, the town is 93 percent white and just 0.1 percent black. According to the mother of a student at the school, the mannequin was an art project and was meant to look like Lebron James. "We have been made aware that a picture taken by the coach or a member of the Plainfield Girls’ Basketball Team has been posted on social media of a puppet that was reportedly posed in a classroom located in the Clark Public Schools," the Clark Public Schools superintendent said. "The Clark Board Education and the Clark Community does not condone any demonstrations of intolerance."